buildingSMART’s purpose is to allow the sharing of information throughout the lifecycle of any built environment asset, between all the participants, regardless of which software application they are using. The machine readable, good quality data should be available for use throughout the design, procurement, construction, maintenance and operation phases. For each asset the intention is that two versions will exist – the real and the digital. The digital model will be relevant throughout the lifecycle and the legacy data will not become obsolete and un-usable. 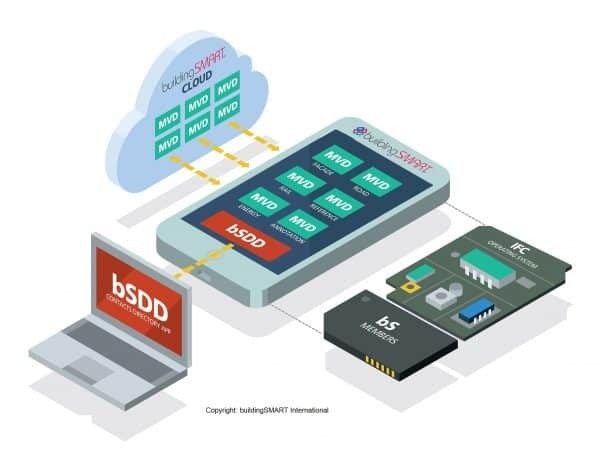 buildingSMART’s technical core is based around a common data schema (model) called IFC that makes it possible to hold and exchange relevant data between different software applications. The IFC is one of five types of open standard in the buildingSMART portfolio, each of which exists to perform different functions in the delivery and support of assets in the built environment. Each buildingSMART International Standard will be translated into an ISO and CEN standard. The basic ‘operating system’ that transports the information and the data. Provides the ability for change management through issue tracking and allows a fully managed cycle. Note that the IFC4 addendum 1 is more up to date than the published ISO standard at the moment. It is helpful to illustrate the buildingSMART model by way of a smart phone analogy. Apps are tools developed for a particular operating system. But they won’t work on a phone running a different operating system. 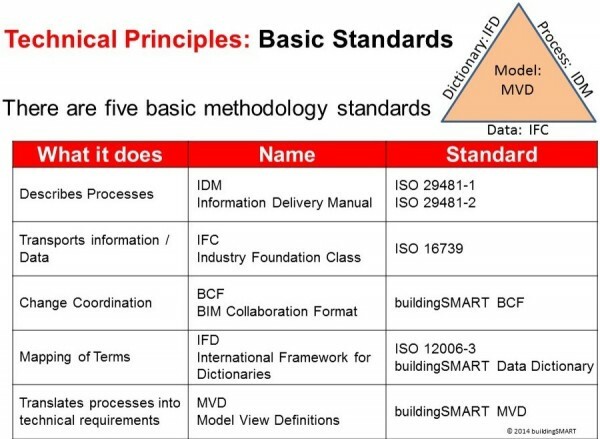 At buildingSMART we’re creating open data standards. We’re developing our solutions with an ‘operating system’ and ‘apps’. Our operating system is the Industry Foundation Classes (IFCs), and our apps are the Model View Definitions (MVDs). The system and apps work internationally and universally by accessing our data dictionary (bSDD), which manages language translations. Unlike a smartphone, where an Android app won’t run on an Apple phone, the idea is that the IFCs are platform-neutral and can all access the same multilingual dictionary. This means they can share digital information easily. They govern the rules and guidelines that allow anyone to create apps and products that will work on any device. Use the IFCs to define your software or products, and you ensure compatibility with all other compatible systems and BIM models. Please see the links below for the technical details of IFC and associated standards.